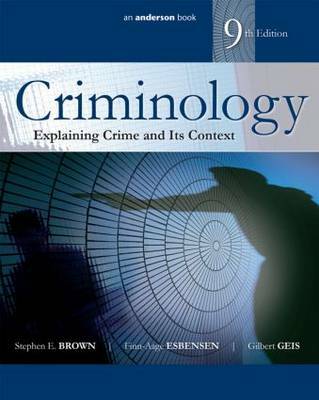 Criminology: Explaining Crime and Its Context, Ninth Edition, is a highly acclaimed textbook offering a broad perspective on criminological theory. It provides students of criminology and sociology with a thorough exposure to a range of theories, contrasting their logic and assumptions, but also highlighting efforts to integrate and blend these frameworks. In this ninth edition, the authors have incorporated new directions that have gained traction in the field, while remaining faithful to their criminological heritage. Among the themes in this work are the relativity of crime (its changing definition) with abundant examples, historical roots of criminology and the lessons they have provided, and the strength and challenges of applying the scientific method. This revision offers enhanced coverage of biosocial theories of crime, more global examples, and a new chapter on youth violence, improving on the most comprehensive and balanced theory text available for undergraduates.